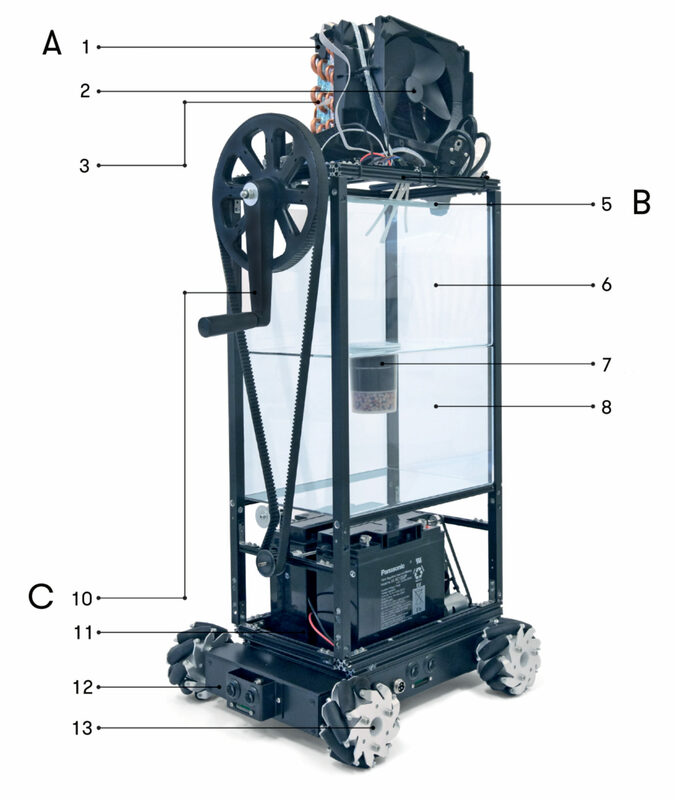 DRYVER is a social and philanthropic robot, that uses condensation techniques to produce water from air. It drives through the city and provides freshly generated water to passers-by on the streets. 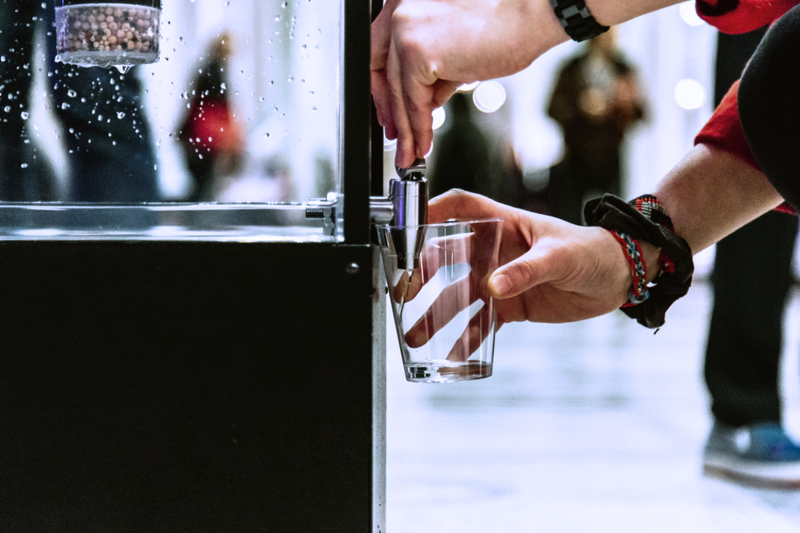 People can interact with the mobile drinking fountain via speech recognition, and in exchange for the water, they are asked to charge the batteries by operating the side-crank – so the DRYVER can continue to move and serve others. The project shows an alternative reality, where robots are integrated in our daily lives. Water has gone from a free natural resource to one of the most successful commercial products of the last hundred years. While the UK has an abundant source of mineral water, over one fifth (22%) of water sold in the UK is sourced overseas. Volvic, Evian and others travel thousands of kilometers in plastic bottles, even though a drinking water tap might be meters away. DRYVER offers the ultimate-local proposal for freely available drinking water, reflecting the absurdity of filling water into bottles and driving it across countries. 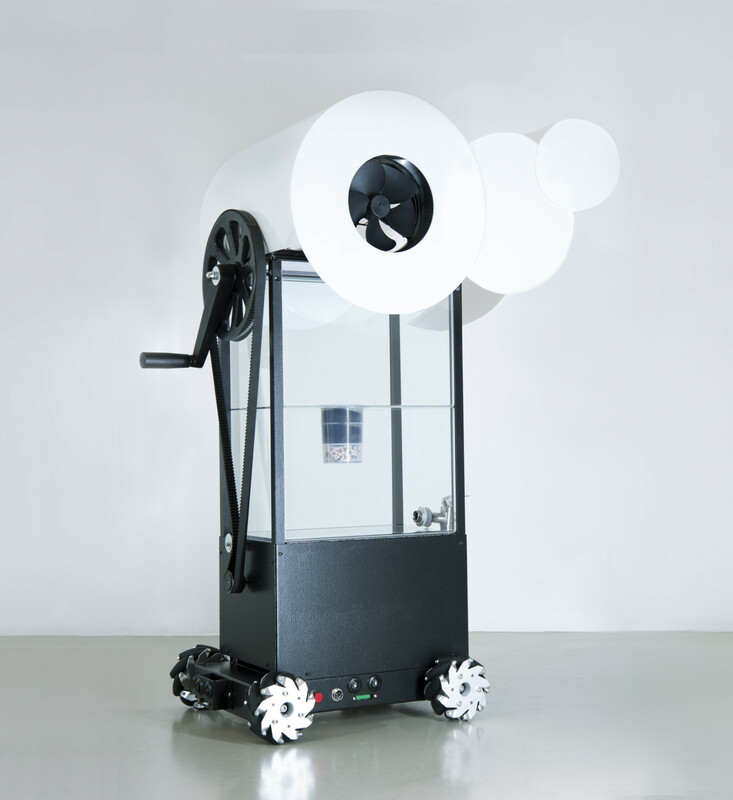 (1) Air Intake Filter draws air into the robot, while a high efficiency particulate air filter (2) removes 99.97% of air pollutant particles such as germs, viruses, toxic dusts and aerosols. Through a heated copper coil (3), the warm air flows to a cooled copper coil (4) which condenses the moisture into liquid form. Once the drop collector (5) is full, it tips and fills the underneath water tank (6). Simply gravity pulls the harvested water through a three-stage filtration (7) which removes the remaining solids by activated coal and provides the water with a mineral source. 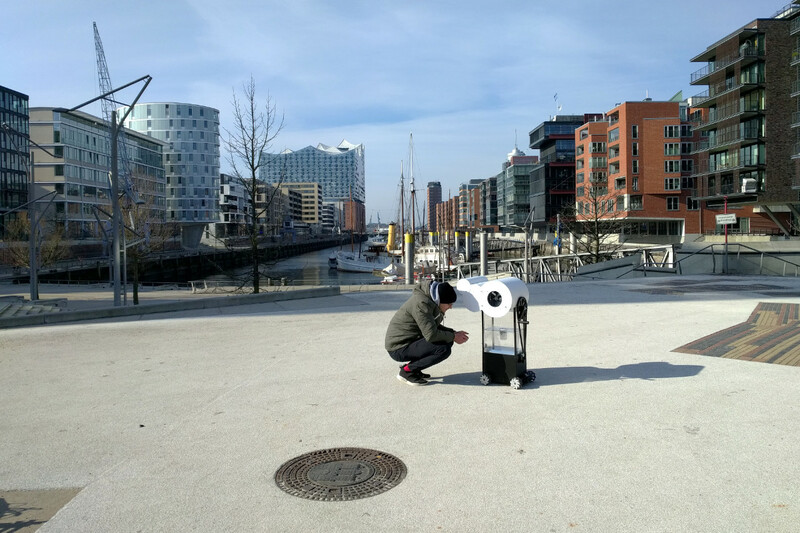 Depending on the relative humidity and temperature of the surrounding air, DRYVER pro duces already up to 10 liters per day at the clean water tank (8). In exchange for the water, people are asked to operate the side-crank (10) and charge the batteries (11), so the DRYVER can move on and serve water to other customers. The robot can carry a weight up to 35 kg at the robot platform (12) and moves vertically and horizontally at the same time powered by omnidirectional wheels (13).